The Stompa Casa 3 high sleeper bed is available in a white frame, a variety of gable ends and sofa colours with a long lasting sturdy pine construction. 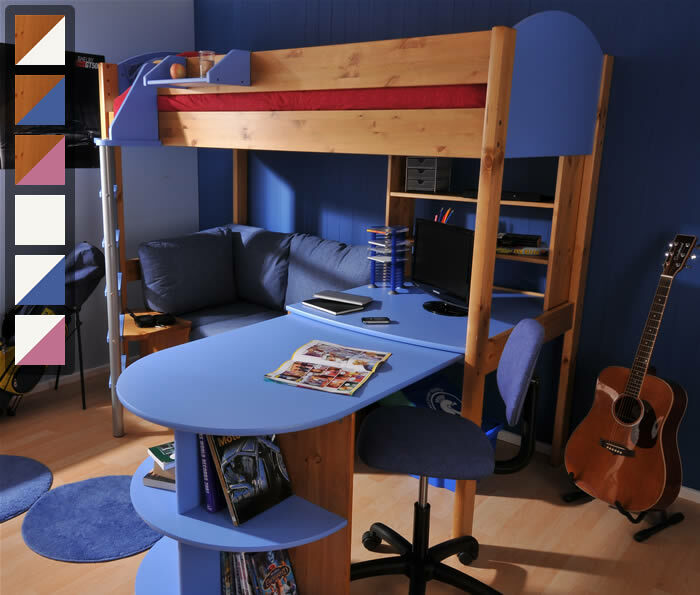 Featuring a reversible layout which allows the ladder to be assembled to the head or foot of the bed. The pull-out sofa bed on the Stompa Casa 3 extends to 2 meters and has a neat little side table, the sofa foam cushions are available in Pink, Blue, Lilac and Black. For storage the Casa 3 has a bookcase style shelving unit positioned to the back of the fixed desk. To extend the desk top work space the Stompa Casa 3 has a pull out desk with curved end shelves for extra storage.